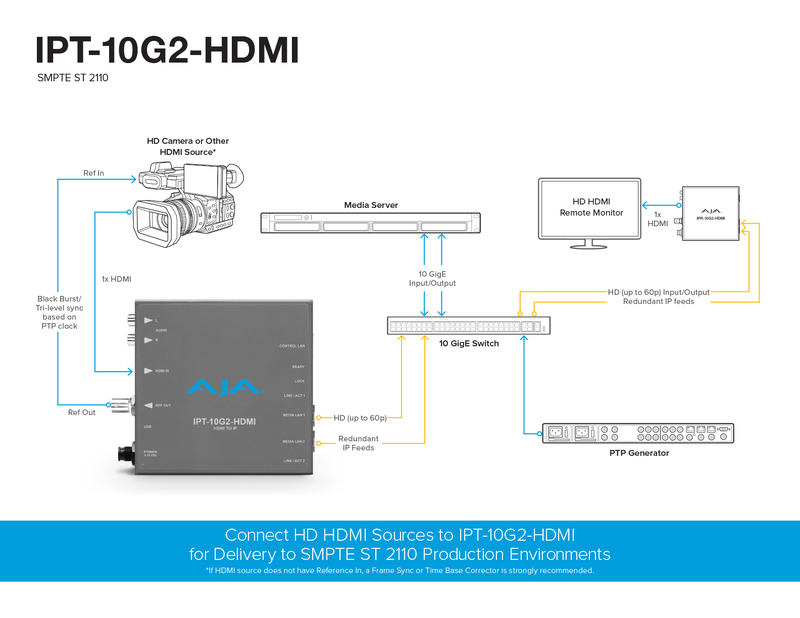 The IPT-10G2-HDMI receives HD baseband video plus eight embedded audio channels on a full-size HDMI 1.4b interface, then formats the data for output as SMPTE ST 2110 over 10 GigE. Associated audio from the video stream is extracted, synchronized, and embedded into the SMPTE ST 2110 stream. Alternatively stereo audio can be fed into the steam from the included RCA inputs. 2x 10 GigE SFP+ cages are provided, allowing “hitless switching” redundancy protection (ST 2022-7) for critical transmission environments. IPT-10G2-HDMI Mini-Converter transmits a SMPTE ST 2110 essence from an incoming HD HDMI input source. Providing two SFP+ cases for protection with "hitless switching" (ST 2022-7), it's rugged, fanless, design is ideal for placement in a wide range of scenarios, including on set, and in studios. With new IP based facilities often requiring integration with traditional baseband sources, IPT-10G2-HDMI provides a simple solution for converting HDMI sources, and then formatting and transmitting via ST 2110 IP to provide that content to a range of destinations. IPT-10G2-HDMI provides two key methods for control. The Control LAN Ethernet port enables control of the Mini-Converter from web browsers on any platform and REST clients. The mini-USB connector facilitates quick and simple initial network configuration and firmware updates.